Dr. Russell was a true Tarheel. He loved his community and his state. He earned his undergraduate and medical degrees from UNC. He was an outstanding athlete and swimmer—so much so that he was offered a position on the UNC swim team. However, he declined this opportunity to complete his undergraduate degree in just three years in order to accelerate his medical training. Following fellowship, he served as a Major in the United States Army Medical Corps at Fort Gordon in Augusta, Georgia. While at Fort Gordon, he established the dialysis program and was also assigned as personal physician to Mamie Eisenhower. In 1975, he and his family moved to Wilson, NC. There, he opened his private practice specializing in internal medicine and nephrology. 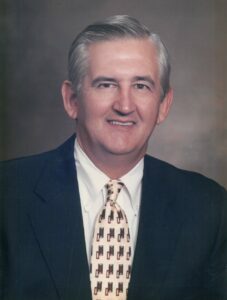 For over 30 years, Dr. Russell invested his time and energy serving the people of eastern North Carolina. He was honored with the UNC School of Medicine Distinguished Service Award in 1993. He made significant contributions to improving care and outcomes of patients with kidney disease in an often underserved area of the state. He also established several dialysis centers that have provided the highest level of treatment for people suffering from end-stage renal disease. His service to his patients and the community inspired generations of UNC nephrology fellows that followed. An obituary can be found in the Raleigh News & Observer .